Welcome to my Trip Report on Hong Kong Airlines Part 3! Time flies past when you are on vacation and this is no exception. Met some nice friends along the way and I hope to return here soon. My heart seems to have gotten itself attached to this city! One of the popular food stalls in Taipei, you can find this near Shida Night Market. This is Raohe Night Market - my favourite market among all. The folks queue up for this - very tasty! This is one of Taipei's Metro Trains - very efficient and comfortable. I recommend going there in the evening to enjoy the sunset and view of the surrounding. I took the ferry to the Bali Island opposite of Danshui. The ride cost only NT23$ and you can use your Easycard to pay. Not as crowded as Danshui. Welcome to Bali - don't get mixed up with Denpasar Bali in Indonesia! I recommend this place for good food! Its located at the market place, take the stairs to basement 1. I have departed Taipei at this very early hour a few times and I can tell you I don't enjoy it at all. 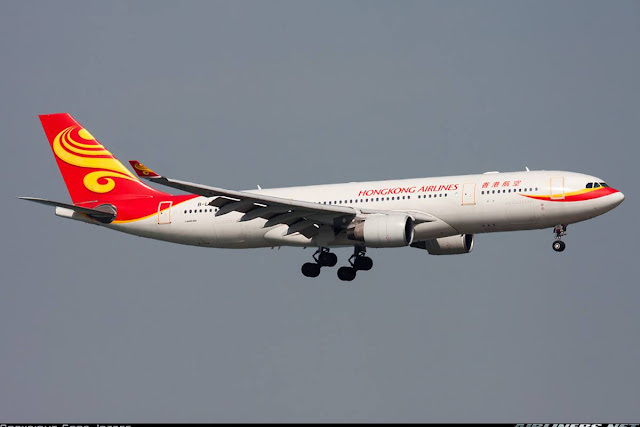 The reason why I chose the 8 a.m Hong Kong Airlines flight is because of the aircraft, Airbus A330-200 - 33V which is supposed to be the newer cabin and I wanted to give it a try. This aircraft operated only at this timing. Sadly, the aircraft type was changed to the A330-200 Old Cabin. Well, that's part and parcel of life for aviation enthusiasts! Anyway, I got up at 4.30 and took the bus to the airport half an hour later. I reach there around 6 and had some spare time left to visit the lounge. EVA Air has 3 lounges and for Hong Kong Airlines passengers, you can only use 'The Club' lounge located within the same area as the other two lounges. Making my way up the escalator to the departure hall. Checking my flight's status - I won't mind a delay. Check in was done quickly - no questions asked about my itinerary. Received my boarding pass for both sectors. I did my on-line check in a couple of days before. The good thing about receiving both boarding passes is that when I arrive in Hong Kong, I can leave immigration without worrying about my luggage. Reluctantly leaving Taipei, but I be back soon! After that was done, I made my wait to the air side. That would take some time as there were a number of flights departing around the same time as mine. Look at the number of flights! That's why this airport is the undisputed number 1 airport in Taiwan. Once I successfully pass through the immigration and security screening, I checked my flight status before making my way to the lounge. With sign boards, it wasn't difficult to find the VIP lounge. As you can see EVA Air has 3 different lounges. The best I heard is the Infinity Star Lounge, I have to try that one day. You can relax over here if you have no lounge access. I was required to show them the VIP lounge pass, as the Business Class boarding pass wasn't enough to gain access. Fortunately for me, the staff called up the Hong Kong Airlines check-in staff and told them to bring the VIP lounge pass over and with that, I was allowed to access this lounge. A stack of newspapers and magazines is available for viewing. The lounge is not big, but at this timing it wasn't crowded, so plenty of seats to choose from. Free Wifi is available but announcement of your flight would not be made. Some hot food and beverages were offered at this lounge, I needed that to kick start my day. Cold drinks and beers were also available for transiting passengers. You can see the other EVA Air lounge at the other side. Got myself a bowl of porridge with Taiwanese side dishes with a packet of Milk Tea. Got myself the butter and chocolate cake and lastly the Yoghurt to satisfy my stomach. I sat near this screen to monitor my flight. Seeing a lady nearby dozing off, I was tempted to do so. But I can't because if I do, I may jeopardize the rest of the flying trip! Once I was done, I headed out and thanked the staff before making my way to the gate. Overall, I find the lounge pretty basic and I won't want to be here if it gets crowded. The quality of food was acceptable, nothing to shout about but at least there is a decent range of food. As for the ambiance, I find it quiet enough to get your work done. Time to say goodbye to 'The Club' Lounge. Do take note of this when you are planning to do some shopping. Make sure you check your departure time and don't forget it! Once the Captain decides to go off, your luggage will be offloaded and you have to arrange for another flight. Heading to the gate. It's at the other end of the terminal. Lots of shops along the way. Checking my flight once again, it was departing on time. Some interesting exhibits along the way. Boarding time was called pretty early. It looked like we were departing on time. As usual business class passengers, passengers with children and Elite members of the airline's membership were allowed to board the aircraft first, while the rest had to wait. Making my way down the aero-bridge. Once I was on board, I was taken to my seat by a friendly crew. What caught my attention at once was the old J class product. Here are the photos. During my photography session, a pre-flight drink was served, I chose the Milk Tea drink. IFE system is stored at the hand rest area. At least in this old cabin, you get more privacy and space. Nice to have the cabin empty for a short period. The USB port and Power point are located at a convenient area. The massage control. Did you see a green light? That is for the crew to see if your seat is at the upright position. That certainly make their workload easier during preparation for arrival and departure. Airline's safety card, Magazines and headset are stored in front of you. Comparing this to the new cabin, which one do you prefer? Back to the old cabin - I took a few more photos before the rest of the passengers came in. Convenient for the businessmen in particular. I prefer this location than the ones located near the legroom area. I had 3 windows for myself. The divider to enhance your privacy when sitting beside a stranger. During take off and landing, it has to be removed. Since the flight was a short one, I didn't bother using the IFE system. In fact, no one was using it in the cabin. Tray is up and ready! Looking forward to my 2nd round of breakfast! What's inside the magazine holder? Aircraft was pushed back on time, and we taxied slowly to the runway. As usual, the runway was crowded, so if you are flying in and out of Taoyuan, expect a delay until the 2nd runway is opened. The cabin crew on this flight were friendly and professional, but lack of warmth. 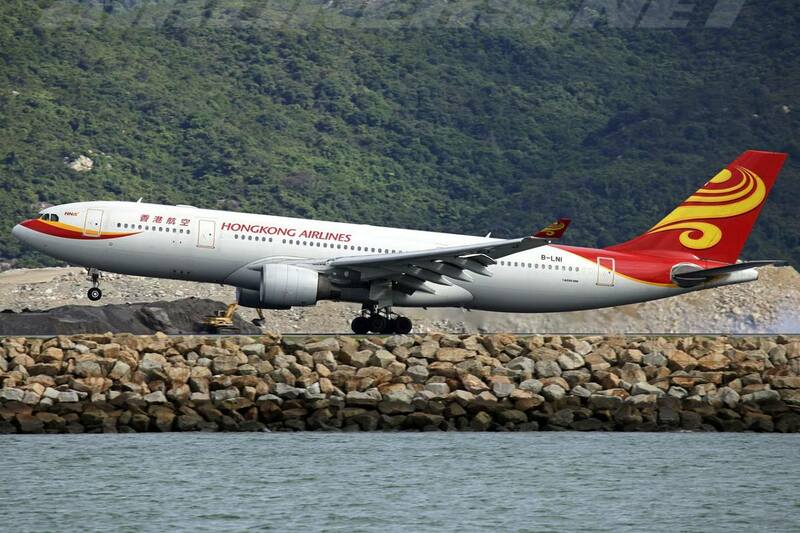 More on this on my last part of Hong Kong Airlines Trip Report. Once everyone settled down, the cabin crew did the usual departure checks and was seated before the take off. Once we were off, we made a few turns towards the South China Sea and headed towards the coast of Xiamen before passing by Macau then final approach to Hong Kong Airport. The ride this time was smooth and seat belt sign was turned off not long after take off. 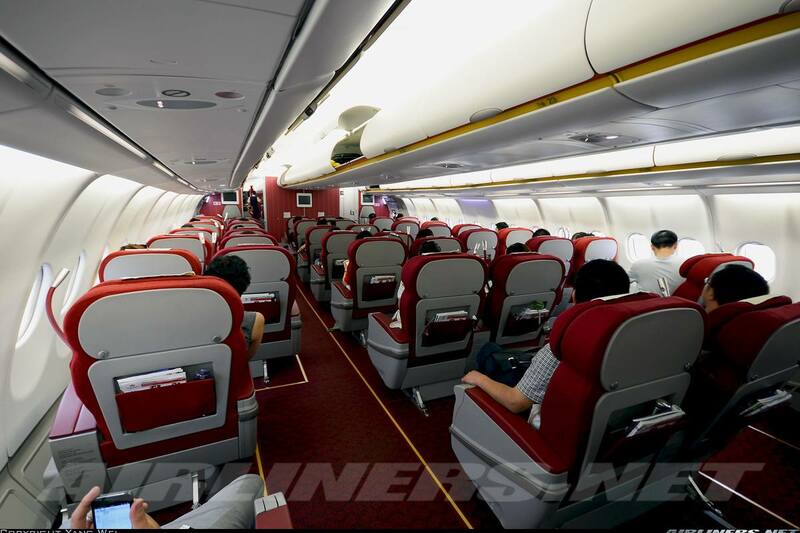 For the crew, it was to be another rush job for them especially for business class passengers. This set of crew looked more relax than my previous flight's. Not long after the seat belt sign was turned off, the crew came around with the napkin, that means one thing - food is on its way! The cabin crew came around to take our order and I can't remember what was the other choice since the menu was taken back after I told her what I wanted. Another glass of Milk Tea! I chose the 'Dim Sum' option and it was average. Once the food tray was cleared, I went to stretch my legs a little bit. I took some Economy Class photos of this aircraft but funny, I couldn't find it on my computer. Anyway, here are some photos from airliners.net. Almost there now, weather certainly looks great! Goodbye Taipei, I'll be back soon! Touched down and the reverse thrust kicked into action. We arrived slightly late due to the delay in take off at Taipei Taoyuan, so airline doesn't get any blame for it. Overall, I prefer the old Business Class product over the new one, as the seat is wider and more privacy compared to the new Business Class, however I prefer the IFE system on the back of the front seat. On the whole, it was a good experience trying out both products. I am not sure whether the airline would be standardising the fleet to the new J class product for the Airbus A330-200, and if they do, I would probably pick the window seat the next time I fly with this airline's J Class. As for the EVA Air Lounge - The Club, it may be small and basic, but it has mostly what you need to get yourself ready for the upcoming flight. Compare this lounge to Club Bauhinia, I prefer the latter. Stay tuned for my last instalment of Hong Kong Airlines Trip Report (Part 4: HKG-PEK).